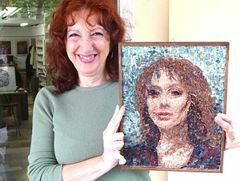 In this intensive workshop is taught how to make portrait in mosaic and, more in general, broaden the view of the mosaic techniques. An instructor explains how to elaborate/resize the image for mosaic purpose. The mosaic, regardless the subject, will be created using classical principles. Typically the portraiture requires a certain ability, and a good understanding of colour synthesis. This workshop is suitable for all skill levels, although a little experience with the hammer and hardie is preferable. Materials and tools are provided by the school, and do not have to be purchased by students. CITY TOUR: The class includes a half-day mosaic city tour with one of our teachers. At the end of the workshop will be given a certificate of participation. Introduction of the ancient and modern techniques used for mosaic portraits. Style, andamento, differences through the centuries: Roman, Byzantyne, Medieval, etc, till our days. Analysis of the subjects and photos to reproduce with a graphic elaboration, in order to obtain the colour synthesis needed for the convertion in mosaic. Lesson on the possibilities of computer use in the field of mosaic. Trace of the subject onto tracing paper. Assemblage and preparation of the materials to use to make the mosaic. How to divide the image into sections, in order to work properly on the definitive binder. Start working on the mosaic. Students who have completed the first mosaic, can start a new one. Lecture on the history, art, and theory of colour used in ancient portraits. Students put the finishing touches on the mosaics. Guided tour to see the portraits in antiquity, and to study the antique faces through binoculars, or opera glasses.